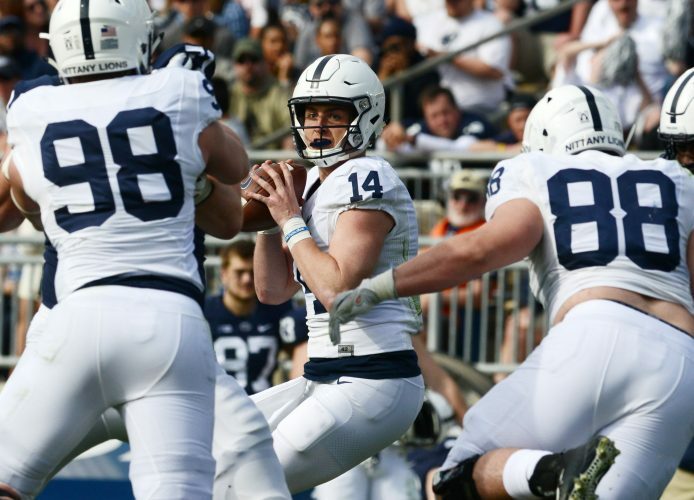 08/04/18 Mirror photo by Patrick Waksmunski / Trace McSorley leads his backups. UNIVERSITY PARK — Throughout his five-year tenure, James Franklin has regularly used examples of bad behavior to help educate his football team. That includes what’s currently going on in Columbus. In case you’ve been in a cave, Ohio State — the Big Ten’s flagship program – has been weighing whether Urban Meyer will remain the Buckeyes’ head coach after last week’s ugly allegations surfaced that Meyer covered up an assistant coach’s abuse reported by the assistant coach’s then wife. Though incidents were investigated in 2009 while the assistant, Zach Smith, was with Meyer at Florida, and again in 2015 at Ohio State, Smith was employed in Columbus until two weeks ago. Moments earlier, in describing running back Miles Sanders, the heir apparent to Saquon Barkley’s tailback throne, Franklin — perhaps ironically — talked in generalities about the challenges of managing a roster of college boys growing into men. Thus, Franklin’s routine power point presentations. 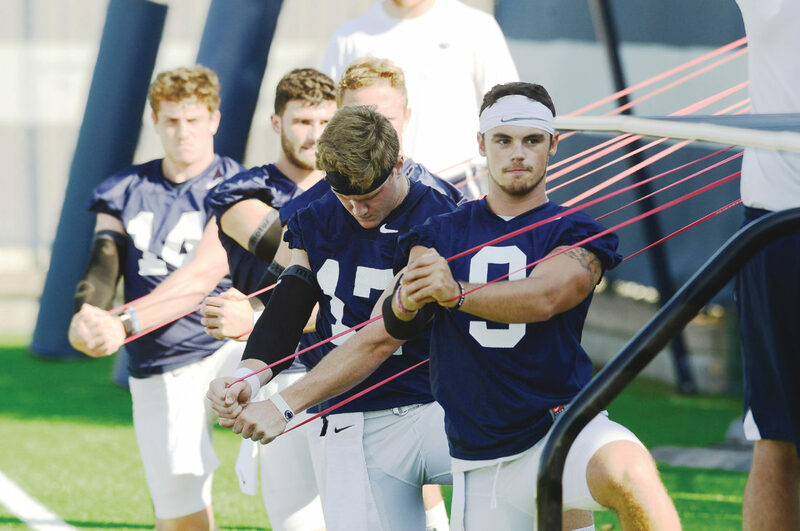 “Every time we have a meeting, before we get into football, he (Franklin) puts down things that are happening across the country that are negative and how we can learn from them,” senior linebacker Koa Farmer said Saturday. Senior safety and defensive captain Nick Scott said the Buckeyes’ situation was not dwelled upon, but it was noted. In addition to the impressive on-field progress Franklin’s tenure has shown — 22-5 in the last two seasons with consecutive Top-10 finishes — his players have toed the line and stayed off the police blotter. So his messages have been heeded. It wasn’t a direct arrow into Columbus, but it could have been aimed that way. With Ohio State in the midst of its firestorm, one can’t help but roll back the tape seven years, to 2011, when Penn State’s world was collapsing under the awful weight of the Sandusky scandal and its alleged cover-up. Ohio State promptly put Meyer on paid administrative leave, which is what Penn State could have done with Joe Paterno — rather than firing him at 10 p.m. in what made a horrendous situation even worse and led to a student riot and a fractured alumni base. And here’s more irony: During the 2011 season, after Meyer’s resignation from Florida when he spent the year as a TV analyst, there was more than a little speculation that he had been anointed to succeed Paterno. But then the Penn State roof caved in, and Meyer took the job at Ohio State, his home state, where his roots were deep. Had he gotten the Penn State job, it’s certainly conceivable to think he would have brought along Smith, the grandson of former Buckeye coach and Meyer mentor Earle Bruce, with him. Just imagine if another scandal engulfed the Nittany Lion program. Instead, Penn State wound up hiring Bill O’Brien — who can never, ever get too much credit for the way he managed the Lions through the NCAA sanctions — and then Franklin, who picked up where O’Brien left off and guided the Lions to Big Ten and Fiesta Bowl championships in the last two years. Ask yourself this morning: Which program, today, is in better shape — the Lions or Buckeyes? Meyer may somehow dodge these bullets and save his job, but he can’t save his reputation, and Ohio State’s major slip could end up benefitting its opponents, the Nittany Lions chief among them. On and off the field, for now and the foreseeable future.